Even though Sony's said that they will replace dead SIXAXIS controllers once the battery life is gone—there's actually a note that the battery has a limited life-span in the manual—they also give you a method for removing the battery. 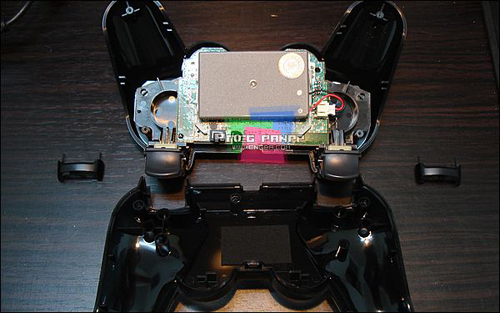 All you have to do is unscrew 5 screws on the back of the controller, pull the casing up, and disconnect the connector to the battery. In the above picture, you can see the connector and the battery (that may be exchangeable without getting an entirely new controller). Our guess is that Sony, or perhaps third party companies, will sell these batteries and you will be able to replace them yourself with 15 minutes and some screwing.